In Brushes, Gradients, Patterns and Palettes dialogs and some other dockable dialogs, you can define tags and then, you can reorganize items according to chosen tags only. „Filter“ field: There, you can enter a tag previously defined or select a tag in the pop list you get by clicking on the arrow head at the right end of the field. Brushes, gradients, patterns, or palettes are filtered and only these that have this chosen tag will be displayed. You can enter several tags, separated with commas. 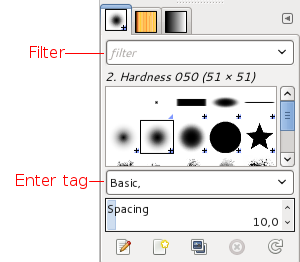 „Enter tag“ field: There, tags belonging to the current brush, gradient, pattern, or palette are displayed. You can add another tag to the current item by clicking on one of the defined tag in the pop up list of the field. You can also create your own tag for this item by typing its name in the field. Then the new tag appears in the tag pop up list. 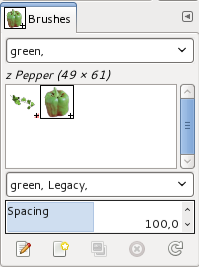 In this example, we defined a „green“ tag for the Pepper and Vine brushes. Then, we entered „green“ in the Filterinput field and so, only brushes with the green tag are displayed. To give several brushes the same tag at once, display brushes in List Mode, and use Ctrl+Mouse Left Button on the brushes you want to select. You can delete tags: select a brush, then select a tag in the „Enter tag“ field and press the Delete key. When this tag has been removed from all brushes, it disappears from the list.